There are a number of options when it comes to choosing glass for your windows and doors, with many serving different purposes. The following is a handy guide to glazing options to help you decide on the best option for you. Windows and doors can make a difference in the energy efficiency of your home. Through the smart use of different glazing options, you can address efficiency challenges while enhancing the long-term performance and liveability of your home. There are both single and double glazed options that provide improved energy efficiency performance. Your representative will be able to explain what energy saving glazing is going to be the most suitable for your project and your budget! Windows and doors are typically the weakest link in the acoustic performance of a home. Careful understanding of the noise problem and the selection of the right windows, doors and glass is critical in reducing the excessive entry of exterior noise. Vlam Hush is a special laminated glass with a 3-ply interlayer that is designed to dampen sound in critical frequencies that can be irritating. Vlam Hush is a thinner and lighter glass offering the equivalent acoustic performance of heavier and thicker glass. It is also a Grade A safety glass and blocks 99% of UV light to help reduce fading of furnishings. With the security of family being of the utmost importance to any homeowner, your selection of windows and doors, together with your choice of performance glass, can contribute to the overall security of your home and the safety of your loved ones. Products like Viridian IntruderGuard look like normal glass yet provide a barrier to forced entry that is 20 times harder to break through than standard float glass and it achieves this without making a building look like a fortress. IntruderGuard is specifically developed to offer a resilient and enduring barrier for vulnerable entry points across a broad range of applications. IntruderGuard is 7.52mm laminated glass and provides extra resistance to penetration because its interlayer is four times thicker than normal laminated glass. The 300 Series Southern Star aluminium products, and all items in the Canterbury timber range, are suited to the use of IntruderGuard. The 300 Series also offers the added security of stronger and sturdier frames, further enhancing its resilience to attack. Extra peace of mind for the security of your family can be achieved by adding lockable hardware as an option to your product of choice where it is not provided as standard. Today, there are minimum requirements for where safety glass must be used in a home. These requirements are specified by two Australian Standards: AS1288 – Glass in buildings: selection and installation; and AS2208 – Safety glazing: glass in buildings. These standards specify that all low level glazing (close to the floor), internal and external glass doors, shower screens, balcony balustrades and overhead glazing must be Grade A Safety glass. However, safety is more than just meeting Australian Standards and we recommend using safety glass throughout your home. Toughened glass is produced by passing cut-to-size annealed float glass through a heat furnace. This process introduces stress into the glass and produces a glass 4–5 times stronger than annealed float glass. Toughened glass can still be broken. However if this does happen it shatters into small fragments, minimising the risk of injury caused by glass splinters. Laminated glass is safety glass that has been manufactured by adhering two or more sheets of glass with a flexible interlayer. The interlayer is made from polyvinyl butyral (PVB) and prevents the glass from disintegrating when broken. The interlayer does not impact the transparency of the glass. 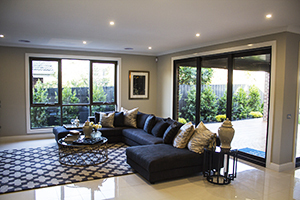 All windows and doors in the Southern Star aluminium and Canterbury timber ranges will suit safety glass options. So talk to your representative to find out more about the available glazing options for our Southern Star aluminium or Canterbury timber products and which ones will best suit you and your building project.